So that’s what Mary did. Excited to give little Brutus his new yummy piece of bull private parts (!!! ), Mary called him over and handed him the prize. Brutus was thrilled! 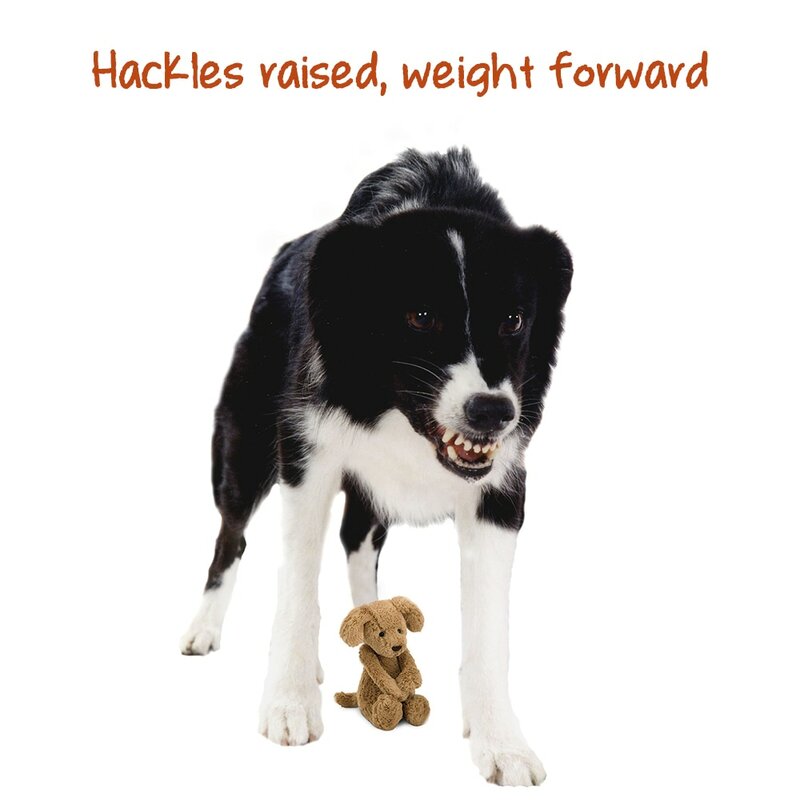 His perky tail started swaying back and forth, and he sprinted across the room to get down to work. But when Mary walked up and started to reach down for it, Brutus growled, snarled, and snapped at her until she backed away. Mary was incredibly shaken. Brutus had never done anything like this before. What happened? What is the dog doing? (Name the exact behavior the dog is doing.) Growling, snarling, and snapping. What is the dog’s body language? (List what the dog looks and sounds like.) Frozen in place as Mary approaches; only his eyes move, fixed on her movements. When she reaches in, he growls, bares teeth, snaps. What is going on? (Describe the context.) Mary approached and reached for Brutus’s bully stick. 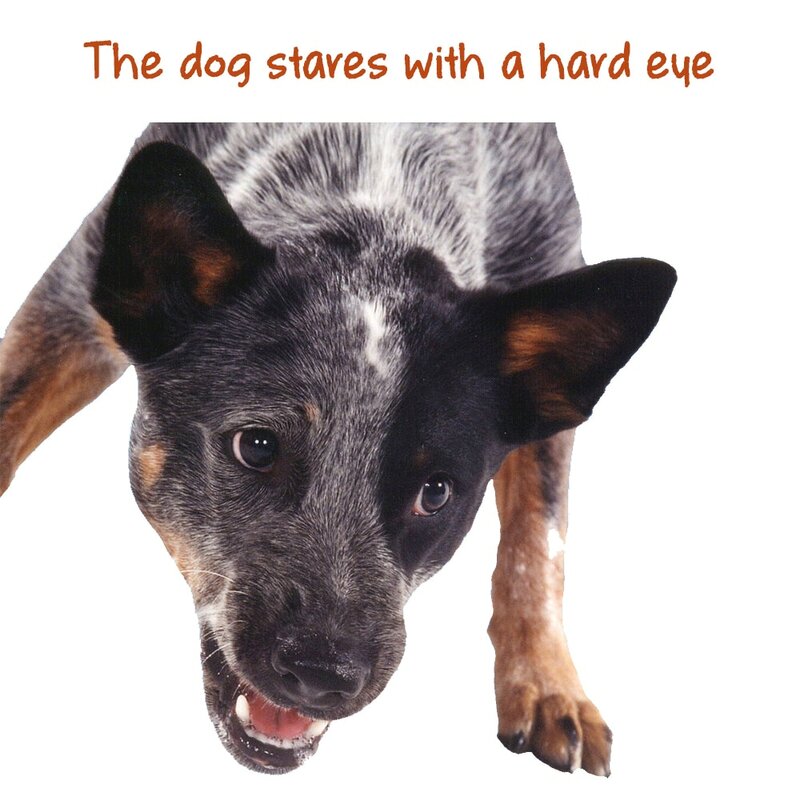 When we click on ​Growling in All About Dogs, we’re taken to information on how dogs behave when they feel threatened or they feel that their “stuff” is being threatened. All three of Brutus’s behaviors — growling, snarling, and snapping — are included in the list of warning signals dogs can give when they feel threatened. The goal is get something or someone to move away from either themselves or a resource they want to protect. 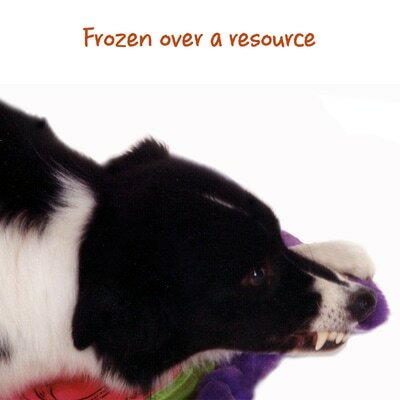 ​But, dogs also growl and snap when they’re playing, so we need more information to solve this puzzle. Brutus is frozen in position. His body tensed up as Maria approached, and the only things that moved were his eyes as they followed her towards him — tons of whites showing. And when Maria reaches in for the bully stick, Brutus growls, bares his teeth, and snaps at her. He begins to relax after Maria moves away. When dogs play, they may still growl and snap, and even show whites of their eyes, but overall their bodies are very relaxed. Rather than frozen like a statue, they are bouncy and loose. Looking at these images, like those from the Body Language Gallery, we can see that Brutus fits into the “distressed” category. His stiff, frozen appearance is the big tipoff. Brutus is lying next to his new bully stick, and Maria approached and is reaching in to grab it. Brutus feels threatened. He’s resource guarding — protecting his bully stick. It’s a perfectly natural instinct that many dogs come equipped with in their DNA. It’s good ol’ fight-or-flight kicking in — the same as we’d likely feel if someone reached in to steal our laptop computer. For some people, learning that resource guarding is a normal dog behavior, is all they need. They just respect their dog’s personal space and don’t grab for his food when he’s near it. Other people would like their dogs to stop doing it. Either choice works. If you would like to train your dog to actually love it instead of feeling threatened when people or other animals come near his food, click here to find a qualified trainer in your area to help.